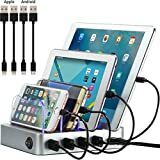 The RAVPower is a 60W, 12A, 6-port USB desktop charging station is fully Compatible with iPhone, iPad Pro/Air/Mini, Galaxy S7-S9, S6 Edge Tablet and many more rechargeable USB items. This product is considered high quality and reliable by more than half a million customers worldwide. It is capable of charging six phones, tablets, or any combination of the two with six 2.4A ports. It charges rapidly with its 60W power supply that produces a 12A output. It comes equipped with a 100V-240V input for global versatility and a 60-inch (1.5m) AC power cord that allows for greater reach to suit various conditions. The iSmart safety feature automatically detects individual charging requirements to prevent short-circuit, overheating, and overcharging. This charger comes with a fire-resistant case and a lengthy 18-month warranty that can even be extended an additional 12 months by registering it with the customer service of the manufacturer. Anker is one of the leading charger brands in America with more than 10 million happy customers. 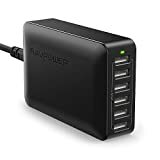 Their PowerPort 6 is a 60W, 6-port USB wall charger compatible with iPhone 6 Plus, 7, 8, X, XR, Xs, XS Max, iPad Pro/Air 2, Mini iPod, Galaxy S6 Edge/Plus, S7, S8, S9, Note 7/8, LG Nexus, HTC and many others. Their exclusive PowerIQ and VoltageBoost work together to deliver the fastest possible charge time with these patented technologies. The six ports on this model give ample connections for every gadget that needs some extra juice. The high-efficiency rating of DOE 6 by the US Department of Energy ensures the maximum benefit for your electric dollar. It is also one of the most compact chargers on the market so it evens saves on space. It comes standard with surge protection, temperature control, and premium industrial-grade circuitry to keep all your electronics safe. It also has a five-foot power cord and an 18-month warranty to guarantee it a quality purchase. 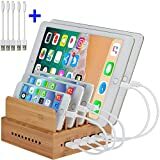 The InkoTimes 5-Port USB multi-device charging station organizer covers a range from cell phones to tablets and is an elegant patented product made from 100% natural bamboo. The intelligent design is an ecologically-friendly charger with a chip integration that enables faster and steadier rates up to 50% over some of its competitors. The internationally compatible 100V-240V powers the USB ports with 12A that is universally utilized by both iOS and Android cell phones, tablets, and other USB equipped devices. The individually removable baffles can be custom-configured to allow space for specific sizes that accommodate the user. A steady, safe, and reliable output is delivered with built-in surge-protection to eliminate the concern for overcharging and overheating. This product is also approved for use worldwide with qualification marks for European Conformity (CE), Restriction of Hazardous Substances (RoHS), and the Federal Communications Commission (FCC). The smart Integrated Chip (smart IC) as part of the mechanism means charging can be supplied through multiple ports simultaneously while still providing the max speed to each. Total power equals 30W from this stylish way of recharging that combines natural beauty with modern capability in one handy organizer. 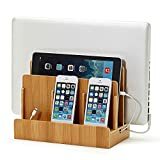 The Eco Bamboo multi-device charging dock & organizer comes with the option of natural bamboo, gloss white, high-gloss cherry, or walnut finishes to fit the tastes and preferences of the user. The original patented design of this charger is courtesy of Great Useful Stuff (GUS) based in San Francisco, CA. It can even be connected to an external charging unit to provide it with power. The sturdy base comes with elastic straps for securing items in place while excess wire length is contained within its classy design. It has ports to accommodate a host of devices like one for laptops such as Toshiba, HP, Dell, Google Chromebook, and all MacBook, one for tablets like Kindle Fire, all iPad, Samsung Galaxy, and Google Nexus, and three for smartphones like Motorola, iPhone, Google Nexus, Samsung Galaxy, and HTC. The wood finish also allows for a wide range of décor adaptability and durability to outlast the competition. Cables are not included with this model but it always comes with a 100% guarantee of quality supported by a 30-day return policy and 12-month warranty against defect. 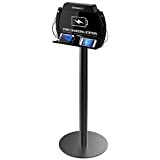 The Hercules Tuff charging station organizer is made for multiple devices to connect with the six assorted short cables included for cell and smartphones, tablets, and other compatible electronics. It is capable of connecting six devices at one time and charging them simultaneously for maximum efficiency in keeping up with productivity. The four cables included are for iPhone 5 and above, one micro USB, one type C, and a six-foot AC power cord. It has baffles that are removable for customizable width adjustments but have a minimum spacing of more than ¾ of an inch that allows for a phone equipped with an impact case to fit easily. This station has a unique feature that lights the corresponding baffles up blue when charging is active and goes out when completed, also. This can be quite useful to know the status of a device with only a look while hands are still free to keep working. Finally, it comes with a 12-month warranty against defect to assure the buyer they can purchase with confidence in the quality. The EasyAcc synthetic-leather double-deck multi-device organizer is made to work with the RAVPower USB charging docks. However, it does not include any cables or charging capability so those must be purchased separately. The modern look and appeal of leather makes it versatile in appearance for the desktop as well as the boardroom conference table. This product boasts a magnetic closure design that ensures an exact fit every time while still offering the ease of separation to quickly allow access. It neatly stores away the unnecessary cable length and/or charging dock within its base to reduce messy clutter reaching across the work area. It is spacious enough to hold up to six different devices and still provide extra storage space for additional items. The synthetic leather finishes are manufactured to endure scratches and wear and even has a second deck that is a convenient drawer for more storage. This organizer is composed of three different pieces that disconnect and reconnect with ease should the need arise. It also comes with a 100% guarantee of satisfaction and 18-month warranty to assure lasting quality for the consumer. 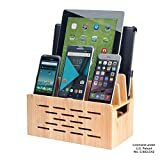 The MobileVision bamboo universal multi-device cord organizer stand and charging station that is made for use with smartphones, tablets, and laptops also has a cutout for a Bluetooth speaker. Function is blended seamlessly with form that allows for a place to keep even the sound from cluttering the workspace. The design includes a space for a multimedia speaker to include entertainment functionality with its space-saving features. The cutout was specially created to enhance the sound propagation of your favorite Bluetooth speaker and leave enough space for a USB-port charger. These devices are not included and must be purchased separately, but can be integrated perfectly into this base. 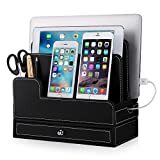 Mobile devices are kept stable on the top rack while cables, speaker, and charger can be neatly stored away underneath the magnetically held lid. Constructed of durable and Eco-friendly bamboo ensures lasting durability and natural style to compliment any décor. The manufacturer offers a hassle-free 30-day refund or replacement guarantee for quality issues. It also has a 12-month warranty for any further concerns or complications that may occur after the initial refund period expires. 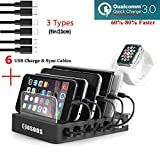 COSOOS fastest multi-device charging station organizer with Qualcomm QC 3.0 technology includes six USB cables of three different types and a watch holder. The cables that come with it are two for iPhone, two micro-USB, and two of type C to provide connectivity for virtually any handheld electronic item. The universal 6-port charger is UL safe and works easily with any device powered with USB like an iPhone, iPad, iWatch, Android smartphone, tablet, Kindle, Samsung Galaxy, smart speaker, power bank, Qi wireless charging pad, and COSOOS headlamp. With the QC 3.0 port, it charges up to 80% faster than the other five QC 2.0 ports, which allows a shorter wait for those times when a delay is too inconvenient. It also has an integrated smart chip to instantly detect the power level required for maximum efficiency and safety for all devices connected. The premium quality circuitry guards against power surges, overcharging, and short-circuiting as approved by certifications from UL, FCC, and CE. As long as it takes a charge through USB, this is all you need, and it comes with a trusty 12-month warranty from the time of purchase to cover any problems. The Simicore smart charging station organizer dock is a compact 4-port multiple USB charger and phone dock with a status indicator. It includes two lightning cables for charging Apple devices and two micro-USB cables for Android as well. Its universal design works with any electronics powered by USB like Apple, Android, tablets, e-readers, digital cameras, Bluetooth headsets, and speakers. The 6.8A output is delivered through four ports that automatically detect the exact voltage requirements of each connected device. It has a rubberized base to keep things from shifting or falling out which makes loading it up safely no problem at all. The input handles 100V-240V to make it capable of use all across the world for wherever the user may need to be. Its compact design makes it simple to transport whether to the next room, next building, or across the pond. It has built-in protection against short-circuit, overcharging, and power surging. It also comes standard with a warranty that covers any issues that occur within the first year after purchase. The last organizer on this rundown is the ChargeTech tower floor-standing charge station that comes with universal tips included. This device is made to be a community charge dock that is compatible with nearly all devices like iPhone, Samsung, Android, and tablets. 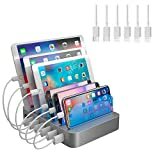 This hub has a greater number of attachments because it is equipped to handle up to eight items plugged in at once while still maintaining charge speeds. The multitude of tips that are standard allows it to be connected to virtually any electronics that USB for power. The default cable layout is four micro-USB, three Apple 8-pin, and one Apple 30-pin, but these can be replaced or upgraded to suit specific needs. Direct contact with the manufacturer enables the consumer to have it custom-configured to carry personalized branding and/or wrapping as well as a different tip assortment. It is constructed with a steel shelf for durability and even has LED lighting to make it more easily accessible in the dark for nighttime use. It utilizes FastCharge technology to provide the quickest turnaround for users on the go and areas where there are multiple users. There is also an anti-theft kit available to secure your investment in this station and a wireless charging adapter for total freedom that can be purchased separately. The manufacturer guarantees satisfaction and backs it up with a warranty for a full year. With all the choices out there it may take a minute to decide which one works best for your situation. Hopefully, this review has provided some insight into the sometimes subtle differences between them. Certainly, it will take some research, but soon the clutter will be just a memory.